"Revenge is a dish better served cold." The flutter of Quentin Tarantino's creative wings is a sight that every movie lover should see at least once in his or her lifetime, even though the opportunity only presents itself at the multiplex once or twice every decade. 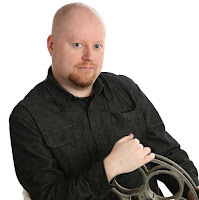 A master of his craft and probably the most inspired amongst his peers, he is someone who loves movies almost as much as he enjoys making them, a detail that provides him with an excellent source of groundwork in his apparent goal to satisfy as many moviegoers as possible. Consider "Pulp Fiction," his most lauded effort to date; here he harvests as many narrative and technical gimmicks as he possibly can in just two short hours, combining a modern mindset with elements of various genres of the 1970s in order to establish something more distinctive than anything done by anyone else in the industry. The movie is quirky, ironic, clever and nostalgic all in the same gulp, and the fact that it always manages to entertain without fail amongst all its style-bending and cliché-melding is further proof of how dedicated the man is to his cause. But don't automatically jump to the assumption that crossbreeding movie genres for the purpose of silly entertainment is all Tarantino is good for, either. Stylistically, his chutzpah for all things offbeat helps raise the bar of enthusiasm, but his immediate virtue lies in the slick way he writes his characters into stories, plots that don't necessarily concern themselves with much depth but thrive at the prospect of minor side details that would otherwise be unimportant in less ambitious films. In his new movie "Kill Bill, Volume 1" (so named "Volume 1" because it is actually half of a bigger picture that will finish out in 2004), that approach goes into hyper-drive from the very first moment it is on screen—in basic premise form, the movie has a paper-thin setup and almost equally flimsy motives, but it sabotages potential mediocrity by enlisting colorful characters in a fray of complexity as the script reveals lots of back-story and then brings it into the forefront. Here is where the movie makes its most obvious departure from Tarantino's past work, too—it has more depth, more exposition, more intrigue and even more style than all three of his previous endeavors rolled into one. Does that make it even more brilliant than the already-flawless "Jackie Brown" and "Pulp Fiction?" Maybe so. Words cannot describe the immense emotional pleasure experienced by watching "Kill Bill, Volume 1" in all its glory. This is cinematic entertainment at its most zealous and cherished, a movie with such raw ambition and spirit that it literally reinvents the standards of everything it can be associated with. Once again drawing inspiration from movie genres of the 1970s to help establish his unconventional vision (in this case, old martial arts films and spaghetti westerns are his notable influences), Tarantino fashions a product here that is a platform for all kinds of quirkiness and irony, with an occasional patch of drama thrown into the mix for good measure. It is infectious. It is mesmerizing. It may very well be one of the most enjoyable and engrossing experiences you will ever have at the cinema. Now as for that "paper-thin" story, here's the scoop: Uma Thurman plays the film's main character, a woman whose actual name is never revealed on screen but is usually referred to by others as "The Bride" (or in other circumstances, her former code name "Black Mamba"). At the opening of the film, our "Bride" is shot in the head by an off-screen foe named Bill, she being the last of nine victims at a wedding party that was ambushed by the murdering madman and his crew of assassins. But she does not die from the tragedy as her enemies would have hoped; rather, she simply falls into a coma and remains that way for four whole years. When she emerges, she finds her unborn baby now gone and her life in shambles, prospects that only fuel an instantaneous desire to seek out revenge on those responsible for the time she has lost. How much deeper the relationship between her and her foes go is never specifically revealed, but the initial suggestion is that the Bride was once part of this troupe of elite assassins herself. Where or how things went wrong is perhaps a detail we will see revealed in the next installment in the saga. What happens, instead, in this first film is essentially the first stages of the Bride's angry vendetta. Here she goes up against Vernita Green, a.k.a. "Copperhead" (Vivica A. 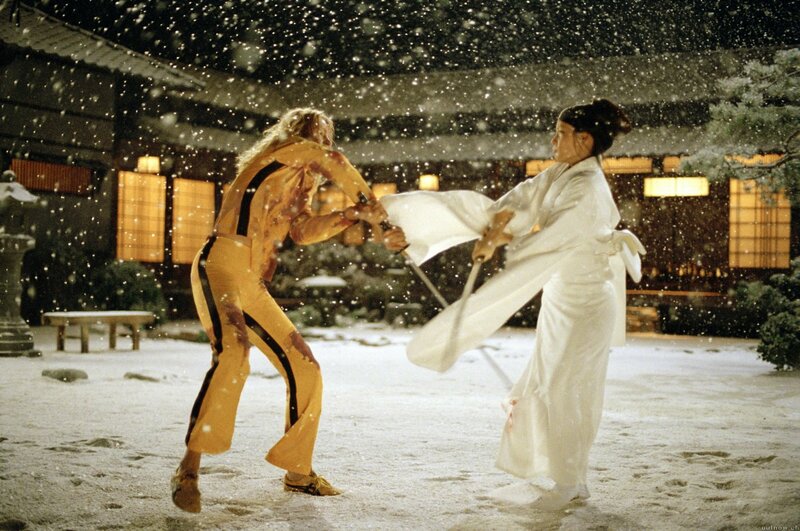 Fox) and O-Ren Ishii, a.k.a. "Cottonmouth" (Lucy Liu), two of the assassins who in the years since their last confrontation with their former adversary have gone on to lead much different lives; Vernita is now a wife and mother in suburbia, while O-Ren has prospered as an Asian assassin and now leads her very own underworld of crime in Japan. Such obstacles still do not take away from the Bride's goals, which are to kill the enemies one by one before confronting the man responsible for all the mayhem in the first place: Bill himself. That is all that needs to be said here regarding story, because reading any kind of description of "Kill Bill" simply does not do it justice; this is one of those movies in which the level of internal enthusiasm requires eyewitnesses rather than people getting their information secondhand. What gives the movie such a flair is in the way it delivers all of its promises through such a varying degree of vision scales. In addition to obligatory elaborate kung fu confrontation sequences that tend to result in massive dismemberment, Tarantino also implores elements of old Hollywood westerns (like probing facial close-ups of significant players) and the classic Samurai movies that required characters to give long-winded confrontation speeches before their inevitable fights. The movie even chooses to tell one of its back stories using Japanese anime, a choice that is perhaps more obligatory than first perceived considering the amount of blood and gore utilized at specific intervals. Surprisingly, all of these traits mesh together cohesively and without disruption; Tarantino makes them part of the same mold without ever showing us the seams. To top that all off, the film is a triumph of technical detail as well, with exquisite cinematography and swift (but clear) editing that keeps the level of tension up even at times when the action wears thin (which isn't often). I do not pretend to consider "Kill Bill" something of high art, because it is clearly not anything of the sort. But it is such a remarkable marriage of all the elements it consists of that none of that matters; it is like few movies we will ever be able to see. A soaring and rousing action film with just as much brain as imagination, this is one of 2003's most remarkable achievements.